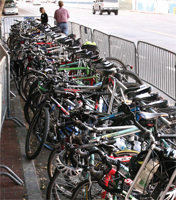 Beer for a better planet: Gordon Biersch provided free parking for participant's in this year's Bike to Work Day on May 17. Wait, don't wear hemp clothing? And trust the government to tell you what to buy? And people want to give you free stuff? This eco-friendly stuff is crazy! EVEN though industry and governments are going to have to make earth-shaking changes to cool things down, there's plenty we can to do help. The basics of reducing our individual carbon footprints are to do what Henry David Thoreau said: "Simplify, simplify." We'll all live better with less-processed, packaged and industrially produced stuff carted here from across the planet. Then there's Wabi Sabi, Japan's esthetic ideal: Less is more. If you aren't using it, give it away or dispose of it responsibly. Before you purchase, be sure there's room for it in your home. Buy local, buy less and reuse, repair, freecycle and recycle more. You may pay more for locally produced, fair trade and organic products, but it evens out when you buy less of everything else and reduce carbon intensive activities like driving. It's not a coincidence that when you do things to save the planet you not only save money, but your life gets simpler, healthier and happier. Here are 50 tips. 1. CUT DOWN YOUR COMMUTE. Prius, Schmius! Choosing an energy-efficient car or converting to alternative fuels like ethanol or biodiesel helps, but you've got to stop driving so much to really make a difference. Check out www.511.org's new Commute Cost and Emissions Calculator and find out just how much your commute is costing your wallet and Mother Earth. Commit to one car-free commute day; 511.org can also help you join or start a carpool. 2. BIKE TO WORK. Stuck for a bike route to work? Svbcbikes.org has maps, or you can call or email the Silicon Valley Bike Coalition for route-mapping assistance. They also have a network of cyclists they can refer you to for personal consultations, and safety programs to help you ride safer. Corinne Winter, SVBC executive director, says 44 percent of our car trips are two miles or less and for shorter trips, even with babies on board, a bike is not slower than a car. "It's not about making every trip a bike trip," she says. It's about integrating alternative modes of transportation into your life where it's appropriate. If you have to take the kids or the car, fine. If everyone can switch to bikes or feet for just a few of their weekly trips that will make a huge difference in our collective carbon footprint. 3. MAKE PUBLIC TRANSPORTATION WORK FOR YOU. Experiment with VTA, BART and Caltrain. There's a trip planner at 511.org. Bart and Caltrain's websites have free PDA schedule downloads. If more people use public transportation, the increase in demand will bring even better service. 4. DISCOVER 'TRIP LINKING.' Plan car trips better to avoid spontaneous single trips and plan errand routes to minimize mileage. Do your weekly shopping in a multistop single trip. Instead of driving to each shopping destination, park your car between them and walk. 5. GO SOLAR. There are new California initiatives to help build a self-sustaining photovoltaic, solar electricity market. The California Solar Initiative provides incentives to convert for existing residential homes and existing and new commercial, industrial and agricultural properties. PG&E's website demystifies solar and offers good information about how to apply for CSI incentives. It also offer dozens of classes on all facets of design and installation for laypersons and builders. 6. GREEN YOUR BUSINESS. Don't have the bandwidth or bread to develop "go greener" programs? Silicon Valley Leadership Group, Sustainable Silicon Valley and PG&E offer free services that help businesses get energy efficient and plug into available subsidies and legislative initiatives. Develop state-of-the-art commuter and telecommuter programs that'll get your employees to work without their cars (again, 511.org is a good place to start). 7. HUG A TREE. It's OK. It's cool now. Better yet, plant a tree. 8. USE LESS PAPER. The third largest industrial emitter of global warming pollution is the pulp and paper industry. Use paper made from post-consumer waste, and recycle your newspapers. 9. RID YOURSELF OF JUNK MAIL. 41pounds.org claims that the average adult gets exactly that much junk mail in a year. You can pay them $41 to nuke it from your life or try these more labor-intensive solutions: Call whoever is mailing you stuff and tell them to stop and to not sell, exchange or give your info to other commercial interests. Write this on their envelopes and mail it to them. When you buy online or through a catalog, or buy a magazine subscription, tell these vendors the same. Opt out of credit card solicitations by calling 1.888.5.Opt-Out. Many junk mailers like ADVO and Val-Pak Coupons have online opt-outs. 10. CUT DOWN ON PRINTER USAGE. Also, don't toss old faxes, reports and letters—put them in your printer face up and print on their blank side. 11. KEEP A CLOSED-DOOR POLICY. Moms know a lot about this. Keeping your doors closed means don't have to turn the heat or air conditioning on as much. Don't set your thermostat too high when it's cold or too low when it's warm. 12. NO TRASH BAGS. Don't use specially bought plastic bags—line your kitchen garbage container with newspaper. 13. LEARN HOW MUCH ENERGY YOU'RE USING IN YOUR HOME. PG&E's website has a home energy calculator and other resources to help you figure out how to conserve. Ditto for your water providers. 14. USE THE SUN TO DRY YOUR CLOTHES. Energy-guzzling gas and electric clothes dryers replaced Grandma's clotheslines, drying umbrellas and wooden drying racks that can be used inside or out. Sun-dried clothes smell good, the sun bleaches whites whiter and you'll seriously reduce your utility bill. 15. OUTSMART YOUR APPLIANCES. If you must use then, run your dishwasher and your laundry machines only when you have full loads. 16. TAKE SHORTER SHOWERS. And use less heated water. 17. BUY ENERGY STAR LABEL APPLIANCES. It's the mark of approval from the federal government, and for once, that's not a bad thing. See the details at energystar.gov. 18. SEAL OFF WINDOWS AND DOORS. Using weather-stripping to seal drafts around windows and doors will cut your heating and cooling expenses and reduce the burning of fossil fuels. It also protects against zombies. 19. GO SECONDHAND. Before purchasing something, ask yourself if you already have it or something similar that can be reused. Can you buy it secondhand at a thrift store or on Craigslist? 20. GET STUFF FREE. If there's something you need only once or twice, don't buy it. Borrow and return it. Go to www.freecycle .org and join a local group to exchange or borrow stuff. It's amazing what you can get for free by browsing the listings or posting a want ad. 21. REVOLUTIONIZE YOUR COMPUTER USAGE. Turn off computers and pull chargers out of the wall when you're not using them. Maximize your CPU settings, like the sleep mode, to reduce energy use. Set your printer to fast quality so you use less toner. Find responsible sellers and their takebacks at www.computertakeback.com. Read the Silicon Valley Toxics Coalition's buying guide at www.svtc.org. 22. REFILL YOUR PRINTER CARTRIDGE. Find a Cartridge World franchise and reuse instead of tossing and buying a new one. Mailing your used cartridges somewhere uses fossil-fuel-intensive air travel. The same with gimmicky faux green products that come with a mailing envelope. Don't mail something to recycle it! 23. RECYCLE RESPONSIBLY. Be sure your e-waste recycler isn't merely collecting and selling it to brokers who'll ship it to a developing nation or a prison where it will be dismantled for salvageable parts and dumped. Go to www.ban.org and choose recyclers like Green Citizen who've taken the Electronics Recycler's Pledge of True Stewardship. 24. DON'T DUMP. At least not on Goodwill or the Salvation Army. If it isn't nice enough for them to sell, or if it's too specialized for them to know what to do with it, they'll have to pay to trash it. 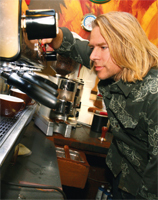 Human beans: Andy Newbom of Barefoot Coffee Roasters points out that buying fair trade coffee reduces the carbon footprint in developing nations. 25. USE THE PUBLIC LIBRARY. There's no need to buy so many books, especially if they're published overseas and sold at a big box store. Any library in Santa Clara County usually either has the book you want or can get it for you from a neighboring library. 26. READ LABELS AND BUY LOCAL. Organic from Canada or overseas isn't as easy on the environment as locally produced products. Buying anything imported across an ocean means a container ship transported it. "Just one container ship traveling one mile produces NOx emissions equaling 25,000 cars traveling the same distance," says Anthony Fournier of the Santa Barbara County Pollution Control District. Foreign manufacturers often use carbon-intensive industrial and environmental practices that are illegal here. Many imports are made in sweatshops where people labor in dangerous work environments and aren't paid fairly. Reducing the demand for imports not only reduces our carbon footprint but also sends a message to big business that we want better for everyone. 27. REDUCE PACKAGING AND PLASTICS. Let's stop using billions of pounds of plastic which uses millions of barrels of oil to produce. Wherever plastic is manufactured the environment gets trashed and the workers and nearby residents get sick from harmful chemical emissions. Plastic bags and water bottles release endocrine disrupters like Phallates and bisphenol A, especially when they're reused or heated. So, like, don't buy heavily packaged stuff, dude! 28. BYOCSB. Bring your own cloth shopping bags. Don't use clear plastic ones for produce. You can buy cloth produce bags online, or throw that head of cauliflower directly into your shopping cart. Why does it need its own plastic bag when you're going to wash and cook it? 29. BYOCC. Bring your own coffee canister. If you buy beans or ground coffee from a coffee shop, bulk sellers will usually let you bring your own containers. Just have them weighed and tagged before you head for the cinnamon. 30. SAY NO TO INDIVIDUAL WRAPS. Choose products without individually plastic-wrapped multiple servings. 31. REALLY SAY NO TO STYROFOAM. If it's sold in Styrofoam, just don't buy it. Ask Jamba Juice and Willow Glen Frozen Yogurt to switch to paper cups and containers. Styrofoam isn't recycled; it never biodegrades; it's just no good. 32. SHOP NAKED. When you shop, don't take bags—bring your own tote bag. If you're muy macho, get a big messenger bag for errands and shopping. Unless you're buying a lot, most reasonably sized nongrocery items will fit in them. New clothes can be rolled up and carted to the car. Lots of small items can be wrapped up in a bandana, then placed in your bag. 33. EVEN POTLUCKS COUNT. Dan and Stacy Scott-Stafford and their Willow Glen neighbors stopped using disposables and bring their own cloth napkins, plates and utensils to their block's weekly potluck. 34. BECOME A LOCAVORE. When you choose out of season organic food that's from journeyed overseas instead of locally grown anything, the pollution caused by the container ships outweighs any benefit you're going to get. Locavores say eating what's available locally is healthier anyway. Cooking dinner? Make a few meals at the same time and stash them in the fridge. 35. SUPPORT YOUR LOCAL FARMER. Visit www.localharvest .org and find the farmers market nearest you. Even better, find a CSA and get your produce from a sustainable local family farm. 36. MAKE YOUR OWN SALAD. Live Earth Farm's Debbie Palmer says make your own organic salad mixes from scratch and use less bagged and precut produce because they use a lot of resources to produce. 37. DON'T BE A SLAVE TO CONVENIENCE. We'll all be paying later for using convenience foods like packaged mixed salads, because they use a lot of resources to produce. 38. AVOID FAST FOOD. Methane-producing factory farming and long-distance shipping are the heart of its business model and they're clear-cutting rain forests to graze their cows. 39. EAT LESS MEAT. Especially beef. The Worldwatch Institute says growing numbers of intensively farmed livestock are responsible for 18 percent of global greenhouse gas emissions and account for 37 percent of emissions of methane, which has more than 20 times the global warming potential of CO2, and 65 percent of emissions of nitrous oxide, another powerful greenhouse gas, coming from manure. 40. AVOID TCHOTCHKES. Just say no to freebies and imported giveaways that you don't really want, need or plan on having around for awhile. Tell your employer and vendors you don't want cheap plastic imported tchotchkes. If you stop taking them, they'll hopefully stop making them. 41. GREEN COFFEE IS DELICIOUS. Barefoot Coffee Roasters' Andy Newbom says that when you buy fair trade or organic coffee you're supporting sustainable farming practices that don't clear-cut trees or use pesticides or chemical fertilizers and that makes a big difference. "Buying fair trade coffee rewards and supports sustainable farming, reducing developing nations' carbon footprint," he says. "It's easy for the first world to say let's reduce our carbon footprint, but it's harder for farmers in developing countries to do this." Buy fair trade beans whole or ground, get a press or cloth filter and make your own. 42. DISPOSABLE CUPS? Really? Do the math: Buying coffee every day in a disposable cup generates at least 20 pounds of paper a year plus several hundred megaindustrially produced plastic covers. Styrofoam cups are worse. Dr. Theo Colborn, in "Our Stolen Future," says researchers have found traces of polystyrene in 100 percent of human tissue tested, because it migrates from the cup into hot food and beverages. Yuk! Bring your own coffee cup! 43. IT'S BETTER TO BREATHE EASY THAN TO LOOK GOOD. Make fashion your slave. Don't buy something trendy that will sit in your closet. Buy clothes that mix and match with your other clothes. You'll have more choices with fewer clothes instead of having a cool pair of retro biker boots or pink Manolos that only go with one outfit. Wear clothes longer, shop secondhand, trade clothes with your friends. Buy shoes that can be repaired. After you replace heels two or three times, then toss them. 44. DON'T BUY HEMP CLOTHING. Yet. Due to archaic anti-marijuana laws, industrial hemp can't be grown in the United States. Buying anything made by exploited slum dwellers in developing nations and carted across oceans in container ships is never a green choice. Learn more about hemp and sweatshops. Join Norml and Global Exchange. Tell state legislators to allow industrial hemp production and put unemployed redwood tree loggers back to work making hemp stuff. 45. AVOID ECO-UNFRIENDLY DRY CLEANING. Although many of the nasty chemicals they use have been banned, the ones they do use aren't good for you, the dry cleaner or the environment. When you need to dry clean, bring your own hangers and leave theirs and the plastic when you pick your stuff. If you're fussy, bring a garment bag. 46. BE A GREEN PARENT. San Jose's Angelica and Sergio Martinez went deep green after their son Marciello was born. "We started Los Antepasados to share the healthy and sustainable ways of our grand ancestors." They recommend breastfeeding, using cloth diapers like Fuzzi Bunz and making simple baby food from scratch, like smashed bananas or sweet potatoes. Give and get hand-me-downs to clothe young 'uns. 47. YOUR GARDEN ISN'T AS GREEN AS YOU THINK. Alrie Middlebrook designs and builds native plant gardens locally. She says take out your water-guzzling lawn and replace it with native plants. They use less water and nourish birds and bees. 48. AVOID CONCRETE. Another garden-design tip from Middlebrook: "If you don't use concrete," she says, "water can percolate through the soil instead of flowing away into storm drains, which conserves water by keeping it on your property." 49. MAKE YOUR HABITAT GOOD FOR HUMANITY. Use locally produced materials and buy certified sustainably harvested wood and wood composites for decking and garden projects. Plant shade trees. "For me, the lawn is a symbol of the oil culture because it's a symbol of waste, cheap energy and extravagance," says Middlebrook. If you wait for your neighbor to do something, your friends, your church or your government, it's going to be too late. You have to do something now." 50. PUSH FOR CHANGE, BIG AND SMALL. Just one idea to get you started: San Jose residents and businesses can ask the city to install bike racks on public rights of ways like city sidewalks. Email [email protected] for more information. According to about.com, 78 degrees Fahrenheit is the best setting for your air conditioner. Initially setting the temperature very low does not cool your house faster, just uses more energy. Reusable cloth tote bags made from Ecospun® (post-consumer, recycled plastic soda bottles) or unbleached, 100 percent cotton canvas are at www.clothbag.com. All of their bags are made in the USA and can be printed with any logo. Several Silicon Valley restaurants such as Parcel 104 and Sent Sovi specialize in local grown food. Global exchange sells fair trade coffee, tea, chocolate, and other sustainably manufactured products online: http://store.gxonline.org. Trader Joe's, Whole Foods and even Starbucks sell fair trade coffee.